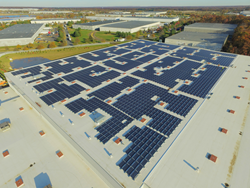 2016 marked a very productive time in the relationship between KB Racking and Evergreen Energy Solutions as we worked together on three large solar projects in the state of New Jersey, totaling a combined 8500 panels. Two of them have already been completed and the third is expected to be fully installed late 2017. The CEO of Evergreen Issac Israel adds, “KB’s team of engineers was very capable of handling the challenges of each project, and worked relentlessly to provide solutions to any and all issues that arose. The help that KB provided with regards to ballasting the system, and ensuring the electrical aspect operated smoothly with the racking was a huge factor in completing each project successfully”.